Britain's oldest man, thought to be one of three surviving UK World War I veterans, has celebrated his 112th birthday with a VIP lunch and fly-past. 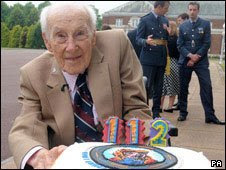 Henry Allingham is also the last surviving original member of the Royal Air Force - formed 90 years ago. A Battle of Britain Memorial Flight, involving a Lancaster bomber, Spitfire and Hurricane, honoured the occasion. The party for Mr Allingham, from Ovingdean, near Brighton, was being held at RAF Cranwell in Lincolnshire. A planned jump by the Royal Air Force Falcons Parachute Display Team had to be cancelled because of low cloud, but the team delivered a birthday card, signed by the Chief of the Air Staff, Air Chief Marshal Sir Glenn Torpy, by Chinook helicopter. Following the fly-past, a two-seater single-engine Tutor aircraft performed an acrobatic display above Cranwell college's main building for the assembled guests, including his great-great-grandchildren Erik Carlson, two, and four-month-old Lila Rose Gray. Air Vice Marshal Peter Dye (retired) and Vice Admiral Sir Adrian Johns attended the event. Mr Allingham was also presented with a birthday card and cake by children from Cranwell Primary School. When asked for the secret of long life, Mr Allingham said: "I don't think there's a particular reason. "The only thing I can say is all my life I have lived within my limitations, take life slowly, don't get any stress or strains. "The more birthdays I enjoy the longer I live." And he said: "The fly-past was a very nice gesture and I want to show my appreciation. "I really enjoyed it, I wasn't too tired which was a good thing actually." AVM Dye said: "Henry is a most modest man but I also think he is the most incredible of individuals. "He has a passion and a determination to tell people about his experiences and to bear witness to those who served like him in World War I." He said Mr Allingham recognised he was "incredibly lucky" to survive the experience, but was " determined to talk" about it and what it meant. Now partially deaf and almost blind, Mr Allingham, who was born in Clapton, London on 6 June 1896, lives at St Dunstan's home for blind ex-servicemen, in Ovingdean. His life has spanned six monarchs and has taken in 21 prime ministers. Mr Allingham grew up without a father after he died from tuberculosis in 1898. His mother died 17 years later. He went on to have two daughters with his wife Dorothy Cater, whom he married in 1919, and now has five grandchildren and 12 great-grandchildren. Mr Allingham's grandson David Gray, 59, from northern Michigan, said his grandfather was nine months younger than the oldest person in the world, and the joint-second oldest person in the world. He said: "It's remarkable. Not only has he lived to this long but he has still got his mental faculties intact. "Our whole family are very proud of him." Mr Gray added it was "pretty special" the RAF put on "this kind of celebration", which got better and better each year. Mr Allingham was accompanied on the visit by close friend Dennis Goodwin, who is also founder of the First World War Veterans' Association. He said Mr Allingham's favourite tipple was a cup of tea with one sugar every morning. Mr Allingham is the last survivor of the Battle of Jutland in 1916 and also fought at the Somme and Ypres where he was bombed and shelled. He joined the Royal Air Force when it was formed from the Royal Naval Air Service (RNAS) and the Army's Flying Corps in 1918. His many medals and honours include the British War Medal, the Victory Medal and the Legion D'Honneur - the highest military accolade awarded by France. He has joked that the secret to his longevity is "cigarettes, whisky and wild women". Still has a sense of humor! There are a bunch of videos of him on the BBC page (while still available), if interested. It's amazing that he's still cognitively intact and maintains a "passion" to tell people about WWI. Having the will to stay engaged with life, people, and interests seems as important as the reliably noted stress-resistant lifestyle and attitude. He also faced significant stressors and setbacks, such as the early deaths of loved ones, but kept on. So much for the theory that daughters inherit their fathers' lifespans and long telomeres, as both of Allingham's daughters died in their 80s. I suppose they could have inherited a particularly exaggerated tendency toward worrying or something like that from the mother. All it takes is one proclivity like that to cancel out the rest of the fantastic genes.